God does have a plan for each stage of your life. Becoming a grandfather opens new opportunities to build a spiritual legacy in your family. 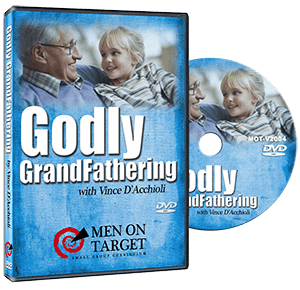 This unique study by Vince D’Acchioli brings a practical and spiritual approach to becoming a Godly Grandfather. If you are a grandfather, father or son, no matter what stage of life you are in, you will come away from this study with a new understanding of what God is calling grandfathers to be a spiritual influence in our family dynamics. The Godly GrandFathering teaching will encourage you to press into all that God has for you and your family. This study is 24 minutes long which provides you (or your small group) plenty of time for lively discussion in a typical small group meeting or Sunday School class.